As with the board game Puerto Rico, players choose roles which can help all players, but the choosing player gets a special privilege with the role chosen. Players build buildings, produce and sell goods, and so on. The game is based on Puerto Rico, but different enough to give players new challenges and opportunities for fun and enjoyment. In San Juan, you build a city worth the most points you can. There is a single deck of cards from which all players draw, and each card represents (among other things) a building. Once any player has constructed 12 buildings, the game ends and the players tabulate whose buildings are worth the most points. Sound like a deck builder? 1. You have a hand of cards. Each card says right on it what it costs to build. The Victory Statue, for instance, costs “4” to build. In order to pay the construction cost, you must take that many cards from your hand and put them face down in the discard pile. So cards are both potential buildings *and* the cash you must use to build them. You have to decide which will be the one you build, and which you will sacrifice to do the construction. 2. Some buildings produce goods, which you can trade for more cards in your hand. The “Coffee Roaster” allows you to put a good of one type on it, and each good is symbolized by a card taken from the top of the deck and put, face down, on the producing building. Later, when you trade that good, it goes directly to the discard pile. So the cards can also be these goods. 3. Each turn is composed of several phases. Build, trade, produce, and so on. You don’t do every phase of each turn, instead, you take turns picking which phase you will do. If you want to trade, you will have to pick the ‘trade’ phase when it’s your turn to do so, or perhaps your opponent will pick ‘trade,’ in which case you can piggyback your own trade(s) because when one of you picks a phase you all get to do it. 4. The person who picks the phase also gets a little boon for doing so. If I’m the one who picks the ‘produce’ phase, everyone gets to produce a good on one production building (Indigo Plant, Coffee Roaster, Silver Refinery, Sugar Mill, and so on), but the person who selected ‘produce’ gets to produce a good on a second production building as well. Each phase has a similar boon for the guy who picked it. Buildings are all worth some victory points toward your final score and most also have some handy little power as well. Some are production buildings, giving you goods for trade, others give you some bonus like an extra card every time you trade goods. Your hand and your cards in play will vary widely from one game to the next, so there’s not really going to be one winning strategy. You might win one game with a bunch of Silver Refineries but find that strategy impossible for one reason or another in the next game, which you win by building a bunch of statues and a couple other buildings which give you a fat bonus for having statues. There is plenty of replayability here. The cards will tend to repeat after awhile, though; even if the strategies vary from game to game the cards will soon become very familiar. The game also plays quickly, in about 20-30 minutes for the 2 player game. I recommend this game for those looking for a game that plays in 20 – 30 minutes and is a card game but also has a sprinkle of “gotcha.” I also heartily recommend this game to those who, like myself, really like Race for the Galaxy but struggle to find people *cough* *suckers* willing to sit still long enough for me to explain how to play. There are a couple very important ways in which this is *not* Race for the Galaxy, with which it is often compared. And which I would, truth be told, prefer playing. First of all, Race for the Galaxy is *much* deeper. There is much more variety in that game and many more paths to victory. This game plays much easier and I wouldn’t hesitate to teach this game to anybody; it just isn’t as much of a punch in the eye as RftG. So it’s not as deep as RftG, *but* it is much more of a crowd pleaser. And it almost scratches the same itch, so it’s a good one to be aware of, if you’re a fan of RftG. Second of all, the phase selection process is different in a very important way. The phases are laid out in the middle of the play area for all to see. If I pick ‘produce,’ we all produce, but only I get the bonus. And that can be terribly important. If I see your strategy likely depends on a trade of a couple goods, I can submarine you by selecting ‘trade’ myself. Even if it’s not ideal for me, I might have completely undone *you* by denying you the boon I guessed you were anticipating. Unlike RftG, there is a *significant* “Gotcha” factor in this game. You may not see it or use it, depending on who you’re playing with, but it’s not something to be overlooked in the right group. This is always the game my wife wants to play (and who am I to turn down any game? )So my review is going to be biased towards the 2 player aspect and will be presented as how I teach the game to a new player. Simply, the cards are potentially buildings, goods to sell or ‘currency’. Every round you have a choice of five roles. Each role can be chosen once per round and your opponent gets to use that role as well. However, the player that chose the role gets a bonus – cheaper building, sell or produce an extra good etc. In the two player game, the first player chooses the 1st and 3rd roles. The game ends when 12 buildings have been placed and that entire turn has finished. Victory points are tallied up to decide the winner. The strategic side of the game is what tactic you will use based on the cards you get: production bias or cheaper buildings? When to choose roles and by playing cards that ‘leech’ off other player’s choices. Knowing when to build and when to risk saving a card for later use and expecially knowing when to get out those expensive 6 cost cards. A great game that scales well for more players, quick to set up, easy to learn and deep enough to know it was not just ‘bad luck’ that stopped you winning. Have you ever dreamed of running your own territory? Being the governor of a prosperous new region? Deciding which buildings are erected and how resources are managed? 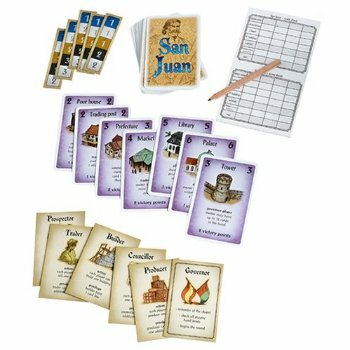 Enter San Juan, a card game from Andreas Seyfarth, Alea, and Rio Grande Games. In San Juan you will race against other players to develop buildings, create a structured production of goods, and accumulate the most victory points. Do you have what it takes to develop the capitol city of Puerto Rico, facilitate the needs of a region, and emerge victorious? If so, then I welcome you to the city of San Juan. San Juan is a strategy game where you build important buildings like houses, palaces, smelters, statues, and other essential building blocks for a populous city. To win the game you must have the highest amount of victory points at the end of the game. Players earn these points by constructing buildings and through secondary goals. The game automatically ends once a player reaches 12 buildings, so San Juan is a game in which you need to be aware of your opponents’ plays. Turns are split up into rounds with players choosing a “role” and then performing an action associated with that role. Roles include governor, trader, builder, miner, councilor, and producer. The way a typical round would go is that the governor, a title passed from player to player each round, would go first by selecting a role, say “builder” for example. Everyone then gets to discard cards from their hands in order to build structures. The amount of cards you must discard to build are listed on the structure card, with some buildings requiring up to six cards to be discarded from your hand. It is only when someone has chosen the builder role that people are allowed to build. The incentive for taking the builder role however is that the player who drew that role gets to discard one card less to build. Each role has a special privilege that only the person fulfilling that role receives. Other role actions include drawing more cards, producing additional goods, or trading more goods. After everyone has taken the action associated with the governor’s role, the next person would get to choose a role, followed by everybody taking that role’s action. This continues until everyone has chosen a role and taken the action that goes along with it. Once this has occurred, the roles are put back in the middle of the table, and the next person at the table receives the governor title, beginning a new round. Depending on how many players are in the game, not every role will be chosen each round, so some rounds will be centered around producing goods, or building, or just drawing more cards. Certain cards play off each other so be aware of how you are helping and hurting your opponents. A good tip is to make sure you have several production buildings that can create indigo, sugar, tobacco, coffee, and silver. Having these buildings produce goods for you, and then selecting the trader role can boost your hand size, allowing you to build more structures the next time the builder role is selected. Included within the game box is 110 cards, 6 role placards, 5 trading house tiles, and one scoring pad. The cards are sturdy and form a single pile. The cards are colored to indicate what type they are and each type of card has a distinct picture and explanation of its uses. The role placards are heavy cardboard and have a description of each role’s abilities printed on the placard itself. This helps alleviate the need to look through the rules to determine uses. The score pad is only used at the end of the game and comes with a lot of pages, allowing for dozens of plays before you need to replenish your paper supply. The game is simple enough to where you could keep score on a blank piece of paper though, so it isn’t a bad thing if you blow through the game’s score pad quickly. The cards included in the game all give their owners special abilities for different phases. Some buildings will allow their owner to produce more goods, or require less cards to build. These abilities are similar to the abilities unlocked by selecting roles, but are permanent throughout the entire game. Violet cards are the more powerful cards that players will want to build, and are restricted so that a player can only build one of each type. One special violet card you will want to use early on in the game is the chapel, which allows you to place cards from your hand underneath it to add victory points at the end of the game. This can really add up if you continuously add cards as you play. When my wife and I sat down to play San Juan for the first time we ended up struggling with the instructions on how to play. There are examples included in the booklet, but if you aren’t familiar with San Juan or Puerto Rico, you may find it easier to look up a video walkthrough on how to play it instead. We had never played a game like San Juan before and were unfamiliar with playing in rounds and picking roles. Once you get the hang of the way the rounds work you should be able to devise your own strategy and play rather quickly. The only other problem we had was that it felt like the violet cards, which restrict you to owning only one of each type, seemed to overwhelm the rest of the cards. There were times where we had nothing but violet cards in our hands because of the majority of the card deck containing these types of cards, and would have liked to see a more diverse amount of production and house cards. San Juan is a unique game that pits players with a choice of what kind of role they want to fill in a developing coast nation. Its simplistic layout and strategic gameplay keeps players coming back for more and I for one am hooked. To date it has earned such honors as the 2004 Spiel des Jahres Recommendation, being a 2004 International Gamers Awards Nominee, and winning the 2004 Japan Boardgame Prize for The Best Japanese Game. If you are looking for a great building game that puts you in control, and allows you to play with 2-3 of your friends, then look no further. San Juan will be your own bustling metropolis before you know it! Game on! 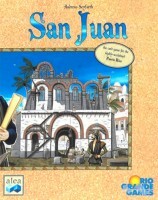 San Juan is a game that was inspired by the groundbreaking strategy game called Puerto Rico. It has the same theme and same role selection mechanic contained in Puerto Rico along with some nice twists. It’s a pure card game and is a lot less fiddly than Puerto Rico, and it plays 2 to 4 players. In San Juan, you again take on the life of a plantation owner where you build your plantation to produce goods and improve parts of the capital of San Juan with better buildings. The goal of the game is to get the most victory points, but the points are found in the cards. This game requires skillful hand management as you try to improve your “tableau” of cards. To put a building or a plantation card down in your “tableau” during the building phase, you must pay for it with cards in your hand to the discard pile. This is the tricky part, because you have to give up some good cards sometimes to put down the right card for the next phase of building your “tableau”. But don’t fret, the deck is reshuffled when it runs out, so you might see the card you’re looking for again. Players choose roles such as building, producing, trading, etc. Each player gets to perform the same roles that is picked, but only the person who picked the role gets the role bonus. The bonus usually involves getting extra cards for some phase for example. The first person to have 12 cards in their tableau ends the game. Then players add up the their points as explained in each card in their tableau. The person with the most points wins. I really like San Juan, because it has a good amount of strategic depth versus standard card games. However, it’s a good game to introduce people to the next level of card driven games like Race for the Galaxy which shares a lot of core mechanics. As I mentioned early, it is a snap to set up, because there are very few extra items beyond the cards themselves. Even though the game says it plays 2 to 4 players, it plays better with 3 to 4 in my opinion. It makes a pretty good family game too! In San Juan players are racing to achieve fame and fortune by building up the city of San Juan. The winner is decided when one player finishes building his 12th building. The player at the end of the game with the most victory points wins. Each round 5 actions are made available through the use of role placards; each role grants the same action to all players, and grants an additional privilege to the role owner. Each turn players must decide which action they want to take; however, once a role has been chosen it is unavailable until the next round. The actions vary from drawing cards, building, producing goods, and selling goods (which grant you more cards). The cards in San Juan function as three things, the building printed on the card, currency (used to build the building), or a good; this simple fact causes players to carefully weigh which buildings they want to construct, and which ones they are going to use as either goods or currency. The game plays quickly and despite the simplicity of the rules there are some key decisions to make throughout the game. Choosing the right role at the right time, to either leverage the privilege or deny that privilege to other players, is the main player interaction mechanic, and the fulcrum of your strategy; however, since the cards you draw are random players will need to continually evaluate their strategy and adapt it based on their current circumstances. Beyond choosing which role to assume on your turn, players must carefully consider how to best use each card in their hand, as some cards must be spent (discarded) in order to win the game. San Juan is not a deep thinking strategy game, instead it is a fast light-medium to medium strategy card game rewarding careful decisions and adaptability.